Meet a driver at the entrance to the cruise terminal, then begin the 2.5- to 3-hour drive to Berlin in a modern, air-conditioned vehicle. Start in the western side of the city at Charlottenburg Palace, former home of the Prussian royals, then drive through the Cold War-era British sector of Berlin. Take in the Kurfürstendamm shopping boulevard, with time to browse the neighborhood’s luxurious boutiques. 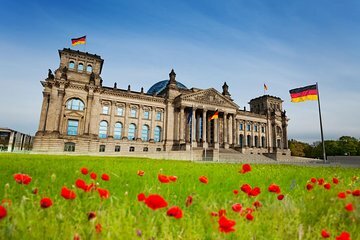 Continue into Tiergarden park, see the Bellevue Presidential Palace, then take in the Reichstag, where the Nazis came to power in 1933. From there, you can continue to a series of Cold War- and Second World War-era sites, and explore the art and cultural landmarks of the former Jewish Quarter. Pause for lunch—the meal is not included in this tour, but your guide can help find the perfect place to eat. From there, head straight into the UNESCO-listed historic center to visit a series of remarkable landmarks including Bebelplatz, the beautiful Gendarmenmarkt square, and a world-famous chocolatier. Before your return trip to Rostock, make a final stop at Checkpoint Charlie and the Berlin Wall, then wave goodbye to Berlin and enjoy the view on the relaxing drive towards the coast. My fiancee and I had a wonderful experience with Barnaby. The driver that picked us up was very knowledgeable and was wonderful driver, he drove us from the port to meet our guide in Berlin. Barnaby was a very impressive and so amazingly brilliant with his expert knowledge . No regrets her. Thank you Barnaby. We had a terrific tour! Our guide, Torbin, was great! He hit all the highlights, answered all our questions, and chose the perfect beer garden for our group to have lunch! We cannot wait to go back to Berlin!